The last couple of years, my husband and I have made an effort to travel more, see more, and hike wherever we can. A lot of our "travelling" is really just seeing more of Arizona..lol While visiting Flagstaff in the fall, we decided to do a hike (more to come about THAT hike in a later post) and visit Bearizona, which is located about 20 minutes from where we were staying in Williams, AZ. 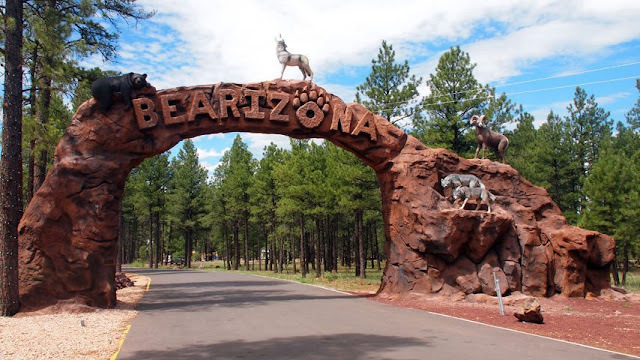 While driving around in Mesa and Tuscan, we always see signs for Bearizona. I really didn't know what it was, but a friend of ours suggested that while we were in Flagstaff we should visit. We decided to do just that and I am so glad we did!! Such a neat experience and unlike any other animal refuge I have ever visited before. Bearizona is approximately 160 acres. Visitors will drive through more than three miles of Ponderosa Pine Forest viewing North American animals in natural habitats when they visit. 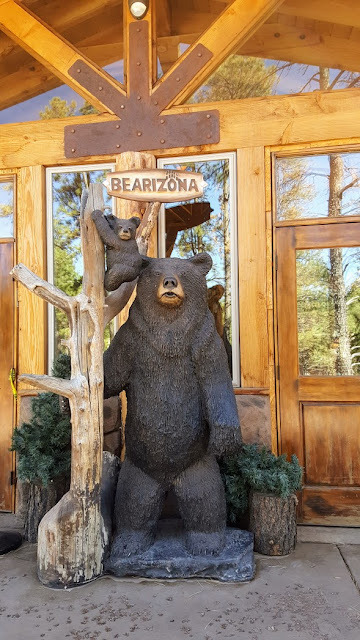 More animals are exhibited in Fort Bearizona, a beautiful 20 acre walk-thru area, along winding paths which is more of a "zoo" type setting. We really had no clue what to expect when we got there, but we had such an amazing time. The park allows visitors to DRIVE... yes I said that correctly.... DRIVE though their animal habitats. You get to see animals in their natural environment and driving through feels more like you are in their home, rather than seeing animals in cages. You can drive through the park as many times as you would like. We chose to drive through 3 times, so I could get more pictures. The first time, there were several cars, which made it difficult to stop and take our time. There was no one behind us the next two times and we could drive as slow as we desired through the park. After the drive through area, we decided to park and walk through their park. They have a really nice restaurant, shopping and more animals to see throughout. We heard it is really pretty to see at night, but we will save that for another visit. Here is a little video from the Bear exhibit area. SOOO COOL!! A few Pictures from our visit... I wish I had taken more photos of the inside of the park to share with you all. We visited the park in October and the weather was perfection. The sun was out, but it was still cool enough for a sweater and jeans. A few photos from the inside of the park. There were a lot of birds wondering the park and the ravens (or maybe they were crows) were some of the biggest I had ever seen. This little guy below would not stay still long enough for me to get just a few good shots. Here is one of the better ones I took. There were a lot more animals and features to see, but you will have to book your own visit to see the rest. 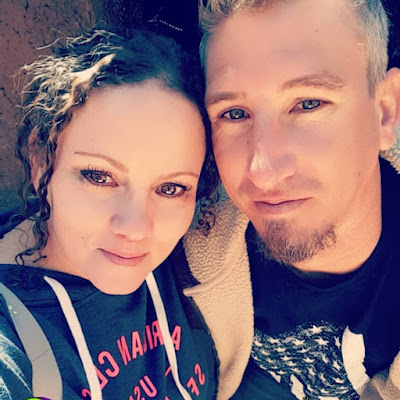 It truly was a fun day and I am glad we decided to check out Bearizona! I will definitely visit again... once the weather is nice, of course. Even though Flagstaff is a bit cooler, I can't imagine any animals walking around when it's over 100 degrees out.